Where Bavaria ends... The "Weisswurst Equator"
Last time we dug down into the rich traditions and culture characteristic of the Bavarian Alps. It is only natural now to delve more deeply into the delicious world of the region’s cuisine. 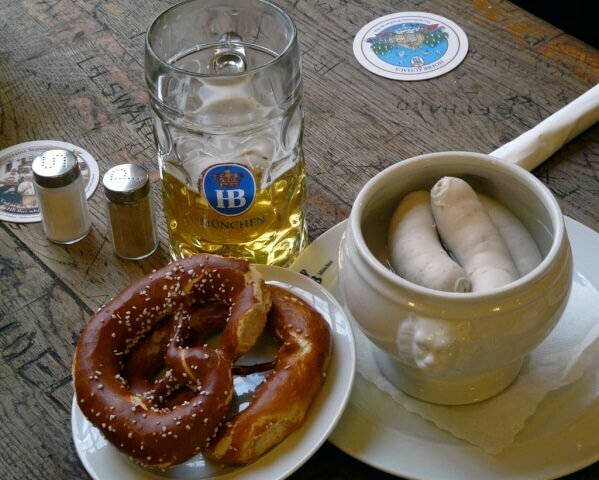 To culinary gurus, Bavaria is referred to as the Weisswurst Equator. Weisswurst is a veal and pork sausage, flavoured with onions, parsley, bacon and other seasonings. First created in Munich in 1857, this particular wurst (sausage) has become an important element to the region’s cuisine. You can enjoy Weisswurst all throughout the state, especially during beer garden season which runs from May to October. While sharing in the camaraderie around communal tables, you can enjoy your Weisswurst, your lager straight from the barrel and some other treats like barbecued pork knuckles and a Camembert cheese spread called “Obatzda” and flavoured with paprika, onions and butter. Soon after the beer gardens shut down, Christmas market season begins. As the weather chills, you can walk through town and village squares and warm your hands and stomach with some traditional mulled wine (Glühwein), gingerbread (Lebkuchen) and other holiday treats. The Bavarian Alps is also home to some fine cheese makers as well, particularly in the Allgäu Alps. There you can delight in local Limburger, Emmenthaler and Weisslacker; the latter, a semi-hard cheese, was first created in the area. The best part is numerous local cheese makers will teach you how to make your own! Bavaria also boasts Leberkäs (a meat loaf of pork and/or beef) and Kässpatzen (an egg-noodle, cheese and caramelised onion dish). Year round, eateries from alpine chalets and cosy inns to upscale urban, restaurants offer a range of Bavarian dishes. The German Food Guide describes the region’s cuisine: “Bavarian cooking is hearty and rustic, making very simple ingredients into tasty, satisfying dishes”. You’ll be delighted by the variety of sausages, pork Schnitzel, the different kinds of Knödel or dumplings (like those of liver or bread) and nourishing soups and stews. For those who have a sweet tooth, you will not be disappointed. Bavarian Alp bakers serve up scrumptious apple strudels, vanilla cookies, sweet omelettes, Bavarian cream with fruit, plum cakes and French toast infused with vanilla bean! Just like your stomach may need to take a rest from all the fine eating, some Bavarian Alp restaurants take a siesta in the afternoon. If you see a sign that reads “Durchgehend warme Küche”, however, it means the establishment serves warm food all throughout the day. You don’t need to feel guilty about indulging while visiting the Bavarian Alps. As you’ll see in our future blogs, there is a plenty to keep you active saving you from having to loosen your belt buckle.